Choreographer William Forsythe, left, with Pacific Northwest Ballet Corps member Ezra Thomson. I am a fan girl. 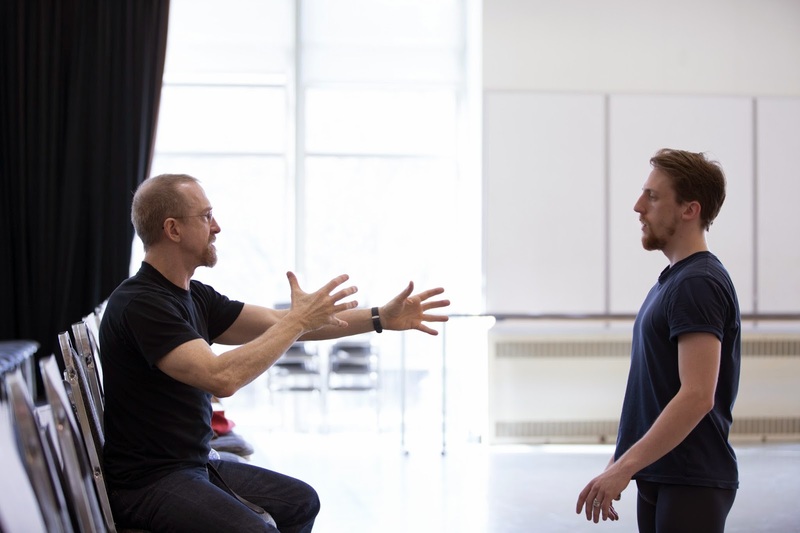 Last week, I got to sit down with one of my choreographic heroes-William Forsythe. Instead, we had a friendly conversation. I came away from it with renewed admiration for both Forsythe’s dance, and his respect and love for his dancers. PNB Principal Dancer Jerome Tisserand and Soloist Elizabeth Murphy rehearse for PNB's "Vertiginous Thrill of Forsythe"
The bill includes one dance Northwest audiences have seen, “In the Middle, Somewhat Elevated.” But PNB also will present the American premiere of “New Suite,” a 2012 compilation of pas de deux that Forsythe says he “rescued” from works that had fallen by the wayside. “New Suite” has been performed only by Germany's Dresden Semperoper Ballett before this Seattle production. If you Google videos of Forsythe ballets, you’ll come up with some hits, but many of those videos are fragmentary, or of poor quality. Forsythe believes that people need to see his work in the arena for which it was created: live, in person. PNB Principal Dancer Lindsi Dec, in costume for "Vertiginous Thrill of Forsythe"
I suppose that’s why he’s made his first professional trip to Seattle to work with the PNB dancers, to ensure this American first is as good as it can possibly be. Forsythe is American, but he's spent most of his professional career in Frankfurt, Germany, first with Frankfurt Ballet, then, after he was forced out, with the dance company that currently bears his name. Many American companies have Forsythe ballets in their repertoires, and the choreographer has worked with some of those companies. When you watch Forsythe in the PNB studios, you understand that part of the ‘can-do’ mentality is fostered by the evident affection and respect that Forsythe has for the dancers. “Gather ‘round, my dears!” he beckons with a smile at a recent rehearsal. “I’m really interested in building good dancers in the process of setting the work, not just setting the work,” he explains. But it’s the work that really seems to thrill dancers. Laura Graham danced for Forsythe at Frankfurt Ballet. Now she travels the world staging his ballets. She's at PNB to teach "New Suites." Graham believes Forsythe’s choreography pushes the borders of traditional ballet, technically, stylistically and emotionally. “Pas de deux, created by Bill, there’s no comparison to any other choreographer. It’s challenging, stimulating, oh, add all the adjectives you want!” she laughs. PNB Principal Dancers Jonathan Porretta and Carrie Imler in "In The Middle, Somewhat Elevated"
It’s clear most of the PNB dancers agree with Graham’s assessment. Principals Seth Orza and Jerome Tisserand wore huge smiles during a recent rehearsal break. Orza, just back from an injury, is still regaining his strength and energy, so he has to push himself hard to meet Forsythe's expectations. And his own. That effort doesn’t seem to faze him. “It’s great,” he says simply. Corps de ballet member Chelsea Adomaitis is more effusive. “It’s the best!” she says with her incandescent smile. The PNB dancers have worked with many of the world’s best living choreographers: Twyla Tharp, Mark Morris, Alexei Ratmansky, to name just a few. But it’s clear that William Forsythe has inspired them to take their work ethic, and their artistry, to a new level. Wow. The man inspires ME! I hope my bosses sit up and pay attention. You can check out Pacific Northwest Ballet’s “The Vertiginous Thrill of Forsythe” March 13-22 and McCaw Hall. Here’s a link for a discount for the March 14th matinee performance. Hope to see you there!